The name Laboratory Information System is more appropriate than say Pathology information system, since the Pathology department serves many functions, and systems should be designed to be functional rather than departmental. Clinical functions such as clinical microbiology (essentially providing consultation service in a specialized area) should be regarded as a direct clinical patient care service facilitated by the Clinical Information System and documented within the Electronic Medical Record. 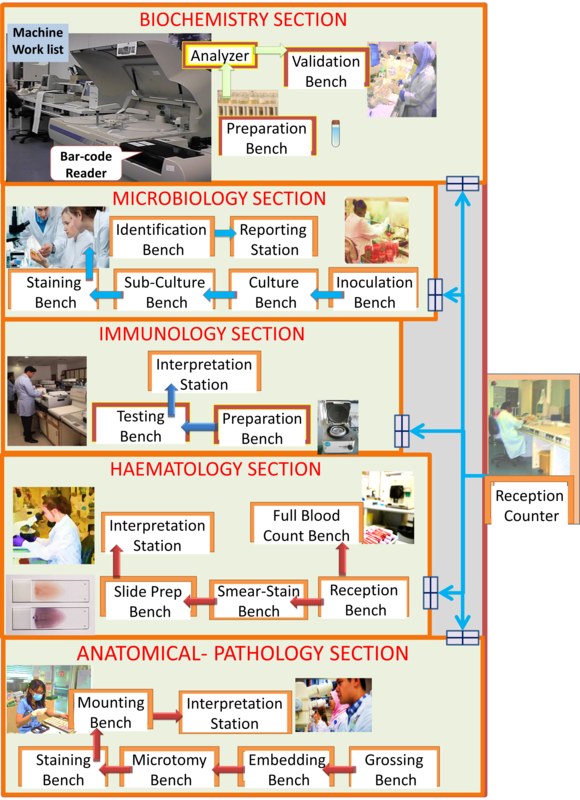 The current state of automation of medical laboratories is described in http://www.ncbi.nlm.nih.gov/pmc/articles/PMC4204236/. The term order is used in a commercial sense i.e. a request for services or goods from a customer rather than the military one. Hence, orders are to be welcomed and are not tasks forced on a person. 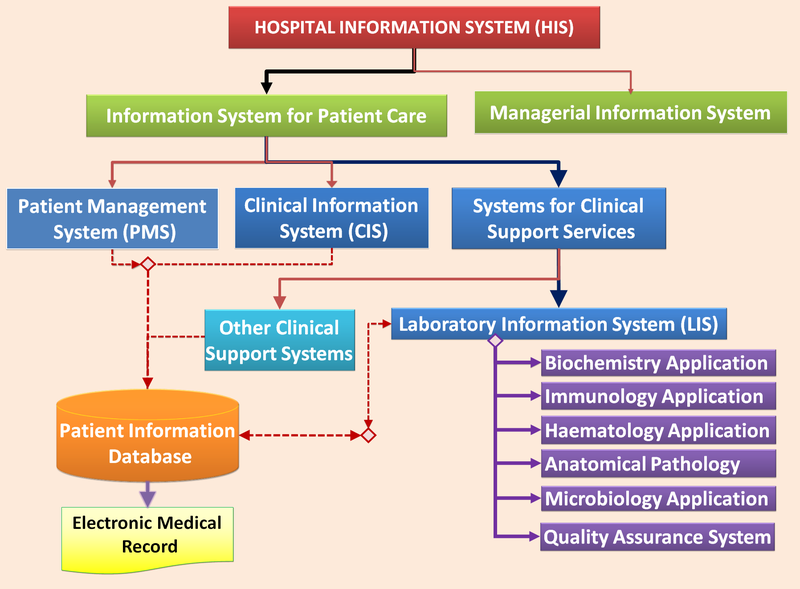 To receive orders, the Laboratory Information System (LIS) is integrated with the Clinical Information System (CIS). Hence the two systems are designed either to be integrated from the very beginning or integrated only after procurement i.e. during implementation..
An integral feature of LIS is the capability of sending messages and getting results from machines that perform tests automatically (analysers) via interface brokers to create works lists, communicate instructions and conversely convey results to the Patient Information Database. When providing results, data from machines can be passed on directly to the Patient Information Database or be held temporarily in an intermediary server-storage system (sometimes called terminal server). The Clinical Information applications extract this data from the Patient Information Database and display them as individual results or charts for viewing by users. The ability of various testing hardware to interface with LIS need to be studied carefully. The main criterion for data interchangeability is the ability to use a common data transport intermediary language which currently is HL7. As both machines and HL7 are continually updated, differences in versions make interfacing a very challenging process. The other is the use of common nomenclature in CIS, LIS and the software used on machines (e.g. LOINC or Snomed CT). For interfaces to work, there is a need for close collaboration between the CIS (OERR, CPOE), LIS and machine vendors during the project implementation phase. A middle ware or interface engine may be required. The LIS is designed to take advantage of computerization and information technology to facilitate laboratory activities and consequently patient care. The overall workflow is quite similar for all the sections but variations occur depending on the technology used for the testing procedure (automated or manual). As a rule for the system to be successful, the processes need to be followed strictly (i.e. according to the standard operating procedure). In an integrated HIS, care providers request for tests by placing orders within the Order entry functionality of the Clinical Information System (CIS). There is a comprehensive list of orders from which an order can be selected. Orders can be grouped according to the test types. If a stand alone LIS is used, the Order-Entry module of LIS can be provided to the clinical user for purposes of ordering, sample printing and dispatching of specimens.In this situation, the Patient Database (PMI) have to be replicated in the LIS database. A compound order is designed to contain orders for several tests. Orders can also be grouped as an order set or part of a care set based on predetermined care plans. Some of these details such as the specimen type, container type, date (or day of year) and time of collection (Accession number) are also printed on bar-code label. 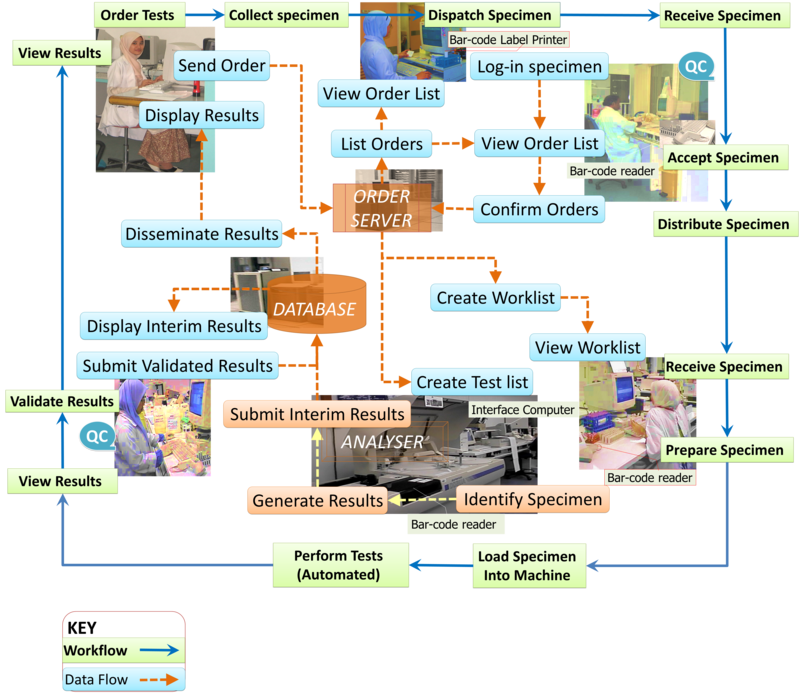 When a test is ordered, the order is sent to the Order Server where the orders for each patient is listed as an Order List. This can be viewed by persons involved in obtaining the blood sample, persons expecting the sample and line managers. Tests are performed on specimens or samples that are taken from patients, by phlebotomists or clinical care providers, usually at clinical area locations. In some institutions, some samples may be taken from the patient by a designated person at the laboratory. Samples can be fluid, solid tissue, swabbed material or smears on a slide. The specimen container and preservative to be used for each test is determined at the time when the application was designed. The system should be capable of prompting the user as to the proper container to use and alerting the user if the container used is not suitable for the test ordered (at the time the specimen is logged). Guides regarding proper collection and use of appropriate for biochemical tests are given at http://www.parkwayhealthlab.com.sg/service-information/specimen-collection-handling/types-of-specimen-collection-containers/ and for haematology tests at http://www.hkl.gov.my/content/Haematology.pdf . The problem of identification is quite unique with regards to samples/specimens in that the they are detached from the patient. Unless the sample is properly matched with the patient at the time of collection it is not possible to do so subsequently. Therefore it is important that the container or tube, where the sample/specimen is put in, has a label denoting the name of the patient and his/her unique ID (Medical Record Number). Subsequently the bar code label will be the only means of identifying the specimen. Also, specimens that are collected from the same patient on different days or at different times need to be differentiated because values often vary with time. It is important that the date and time the specimen is is collected, the laboratory section performing the test, together with a serial number (the sample number) is included in the bar-code. This number termed as the Accession number together with the patient ID usually gives each specimen a unique identity. It also denotes that that the sample/specimen is registered with the LIS. The Accession number is printed on a sticky bar-coded label and attached to the sample/specimen container. At any point in the work process and at any location the identity of the specimen is known by reading the bar code using bar code readers or scanners. The patient from whom the specimen is taken known because the Accession number assigned only to that particular patient. The person entrusted to collect specimens views the orders on the Order lists. If collection is to be done by a phlebotomist or an assigned care provider, as an added step a collections list may also be made available. He/she needs to identify the patient correctly before taking the sample by comparing certain identifiers including name, gender and age on the computer with the actual patient before printing out the label. It is best to have a mobile or hand-held computer when taking blood specimens. Patients should wear bar-coded identification tags which when read (preferably with a bar code reader) confirms the patient’s identity. Otherwise, the person collecting the specimen should ask the patient for his name, rather than call him/her out by name. In the inpatient and day care setting the patient remains at the bed and the container and label is brought to it. In fact it would be be better to print the label by the bedside if the facility is available. As a precaution, the label should be shown to the patient for him/her to ascertain that the name and other unique identifier on the label belongs to him. The patient should also be informed what test is to be carried out. For outpatients, specimens are usually collected at a designated location. It is quite usual to call out the patient by name, but the identity need to be confirmed. It is best if the patient carries an identification card for example a follow up card. The person taking the blood sample usually have the computer in front of him/her and therefore is able to confirm the identification particulars on the computer with the patient. When specimens (usually tissue biopsies) are collected during surgery, endoscopy, needle biopsy or interventional radiology, each biopsy need to be placed in different containers. The operator (e.g. surgeon or endoscopist) need to name each sample/specimen separately e.g. Specimen A: biopsy from antrum of stomach. When the availability of the specimen is uncertain, an order may not have been made and therefore a label may not have been printed. In these instances a temporary hand-written label may be used. The operator or his/her assistant will then have to place the relevant orders and generate a proper label to replace the temporary one. The information on the label in alphanumeric form consists of unique identifiers usually the name MRN number and perhaps the date of birth which can be read by the person collecting the specimen and the patient. This is inadequate for proper identification of the patient. Because of this he/she needs to be familiar with other identifiers of the patient (e.g. gender, age, ethnic group etc.) by viewing this information on the computer. The bar-code on the label is machine readable. It is usually alphanumeric i.e. consist of alphabets and numbers. The alphabets may indicate the laboratory section/work station location. The numeric part indicates the date and time the specimen is is collected, the and a running serial number for the day (the sample number). For safety, a standard work instruction (below) regarding specimen collection is used. Perform on one patient at a time. Proceed to the next patient only after the task is completed. First of all, the label is printed (unless the label can be printed by the bedside). To ensure that the specimen is that of the patient, proceed with either of two methods. Method A: Stick the label to the container appropriate for the test. Bring the container to the patient, together with other specimen taking paraphernalia. Ask for the patient’s name. Compare other known identifiers such as Gender, Age and Ethnic group with the patient. Ensure that the name and other identifiers on the label matches that of the patient. Also, show the label to the patient to confirm this. Take the sample and place it in the container. Method B: Leave the container and the label separated. Bring both to the patient. Compare the name and other identifiers of the patient with that on the label. Show the label to the patient. Take the sample and place it into the container. Stick the label to the container. In a fully integrated system, the specimen is registered when the order is placed and a request is made to print a label. This request forces the system to provide an accession number and therefore essentially registers the sample/specimen. Once obtained the specimens can be recorded manually as collected (optional). This will render the status of the order at the Order Server as ‘Specimen Collected’. Usually, specimens/samples are gathered in a batch and then dispatched to the reception of the appropriate laboratory. The specimen may be sent off immediately or in a batch. The person sending off the specimen need to log in and record this action in the Specimen Log-in/Dispatch application which will update the status of the work process at the Order Server as “Dispatched”. If the specimen is acceptable the requests are confirmed and this is transmitted to the Order server. The status of the task becomes ‘Specimen received’. The server converts the orders to tasks and a Task list is created for the specimen. It is also assigned to a particular workstation/bench. If the specimen is not suitable, the test does not proceed and the status of ‘Rejected’ is recorded in the Order server and made known to the care providers. They may then opt to collect another specimen. Technicians in charge of a particular group of tests (assigned to a work bench) will be given work lists regardless whether the test is performed manually or by a machine. A similar list is also passed on to any automated/ semi-automated machine via HL7 facilitated communications interface. Based on the work lists, samples/specimens are sorted according to where the corresponding tests are to be performed. They are sent to their destination by hand or on a mechanized track. Technicians in charge will use the work list to acknowledge receipt of the samples/specimens and proceed with the tests. At the Order server the confirmed orders are converted into tasks and a task list (set of tests to be performed) is created for the specimen. For each workstation, all the tasks for all specimens are compiled as a work list. On arrival at the station, using a bar code scanner the technician in charge confirms that the specimen is part of the work list and acknowledges receipt of the specimen. This changes the status of the task to ‘Started’. If the technician has performed her part of the process, he/she need to denote that this process as ‘done’. This will result in the particular sample being removed from his/her active work list. If the same sample is to be used at another station, the sample need to be transferred manually to appropriate work bench or station unless a fully automated mechanized track system is used. A the work list consisting of tests to be done there would have been created. The technician there or automated machine will then perform the tests indicated in the work list. Currently, nearly all biochemical, immunological and most haematological tests are automated but some existing analyzers may accept orders from the LIS but cannot pass results across. Results will then have to be entered by transcription. There may also be existing machines that cannot receive orders via an interface but can pass results across. Therefore identification data and test requests need to be entered into the machine (analyser) manually. There are also situations where machine produced results have to be read manually, displayed on the machine’s computer or printed out. The entry of results data into the information system therefore has to be done manually (by transcription). These situations slow down the process and also introduce the risk of transcription error. The need to prepare specimens depends on the type of sample and the test to be performed. Biochemical tests are usually performed on serum or plasma which are separated from the cellular elements through centrifugation. It would be convenient if the container (test tube) used to collect the blood can be centrifuged and is also accepted by the analyzer used to perform the test. Otherwise the serum or plasma has to be decanted (transferred) to another container suitable for the machine. Also, if plasma or serum from the same sample need to be used on different machines then part of it (an aliquot) need to be placed in a separate container. These situations will require re-printing of the bar-code label to retain identity of the specimen. Tests on urine, cerebrospinal fluid and effusions are performed in a similar manner. For tests on cellular elements of blood (red blood cells, white blood cells and platelets) these elements need to be well preserved using various types of anticoagulants. Analysers for this purpose use the method of flow cytometry. For Full Blood Count the specimen is diluted in an electrolyte solution. Next, the machine aspirates a very small amount of the specimen and pass them to the counter which has an aperture through which light or electrical impulses are passed. If light is used, data about the size and aspects of light as they pass through the cells (called front and side scatter) is analyzed. If electricity is used, electrical impedance caused by the cells is detected by a sensor. Degrees of impedance denote different cell types. Some tests, notably anatomical pathology tests, blood film microscopy and bacteriology, are still performed, in part, manually. The LIS supports the manual processing of specimens by creating a work list, maintaining a log of the task status and supplying labels. Orders can be converted into work-lists for technologists to process specimens. Once processed specimen samples (usually slides) are ready, work-lists need to be created for pathologists, haematologists or microbiologists to interpret them. The processed specimen samples (slides) are examined under the microscope and interpreted by pathologists, haematologists and microbiologists who then report their findings. By connecting microscopes to LCD projectors, photographs can be taken of views selected by pathologists, stored in the database and made available to users in the CIS and Electronic Medical Record. Blood from the specimen is smeared on to a glass slide, stained and viewed under the microscope. It is important that bar code labels are attached to the slide to ensure continuity of matching specimen to the right patient. Pathologists examine tissues under the microscope to look at their appearance (morphology) and reaction to various stains and chemicals. The specimen can be organs or tissue removed at surgery or biopsy specimens taken during endoscopy, large needle biopsy or fine needle biopsy. Specimens taken at surgery are placed in bags or large containers or bottles depending on their size. The surgeon need to name the specimen (organ type, origin/location taken) and ensure that bar-code labels are attached. If more than one specimen is taken, they are put in separate containers and would have different accession numbers. If the same tissue is taken at different locations/depths/segments, they can be labelled as A, B, C and so on with details regarding their location submitted as order details. It is best to place specimens into labeled containers as soon as they are taken and not at the end of the procedure. At laboratory for large specimens, samples from various parts of the organ are taken by the pathologist (a process called ‘grossing’). Each has to be placed in separate containers and labelled with notes regarding where they are taken. With small specimens this step is not necessary. The tissue is then embedded in paraffin within a holder which is also labeled. The tissue is then sliced to create thin sections. It is essential that this process is performed on the specimen of a single patient at a time and as soon as it is placed on the slide a label is attached. The tissue is then stained and made ready for examination under the microscope. With cytology specimens taken using fine needle aspiration biopsy, the aspirate are smeared immediately on to labeled glass slides and fixed (usually with 95% alcohol). The aspirate are then stained. Specimens are collected as fluid (like blood, sputum, discharge, effusions or frank pus) or smears/swabs. Direct smear of the sample on glass slides are stained and examined under the microscope. Organisms with distinct characteristics (such as Niseria Gonorrhoea and Mycobacterium tuberculosis) can be identified. Culture of the organism involves introducing the sample into growth media (broth or agar plates). For some types of sample this is done at the clinical area. broth containing various types growth enhancing as well growth suppression agents. For fluid sample (especially blood) grown in broth, the early part of the process of culturing can be monitored using automated growth detection methods. These machines (e.g. the Bactec™ system) monitor growth by detecting the production of CO2. Photo detectors measure the change in the level of fluorescence in dye at the bottom of the container caused by the presence of CO2. By interfacing these machines to LIS, evidence of growth (positive culture) can be made known to technologists as early as 10 hours after incubation. A diverse range of biochemical reagents are known for the identification of certain metabolisms and to differentiate between bacteria. Serological methods such as Western blot, Immuno-precipitation and Enzyme Linked Immuno-sorbant Assay (ELISA) use antibodies to detect specific proteins that are unique and/or characteristic of a microorganism. The applicability of serological methods is dependent on the availability, sensitivity and specificity of the antibodies used. There are commercial kits available for immuno-detection of several microorganisms. http://cid.oxfordjournals.org/content/49/11/1749.full provides a good discussion on the issues involved. The LIS creates a Task List for the pathologist and slides are made available as and when they are ready. An appropriate reporting form for entry of structured data or text are made available. Reporting can be performed by typing directly into the forms or through dictation via a voice recognition system and then transmitted to the Patient Information Database. It is expected that the different test types would have variations in the workflows and naming conventions. The application software would be customized accordingly. Whatever the mechanisms used, verification methods may be introduced and data regarding the work status may be recorded as part of the information given. The LIS should record the stages in the test performance (e.g. received, in process, completed and validated) and display these statuses in the Order Entry Result Reporting System (OERR). Results should be made available initially in LIS for purposes of validation. An intermediary server (terminal server) may be used to hold these results temporarily before they are validated and released. However validation may be automated (by default) or be performed manually by laboratory personnel. For purposes of validation, the LIS should be integrated with the Laboratory Quality Assurance System. Clinicians should be able to access results as soon as they are available in the Patient Information Database via the Clinical Information System. The results should be shown in a table or “Flowsheet” format based on chronology of the time specimens are taken. A well designed LIS has built-in mechanisms that provide alerts regarding results beyond expected values for purposes of validation. The system has the facility for automated validation besides manual validation. There is a mechanism to record failure at various stages including specimen rejection, machine failure and invalid results. These are made available as a standard report. The LIS enables test samples to be tested and results recorded. There is a facility to compare test results with expected results or external QC results if they are entered. The system provides standard reports on the comparison of test vs. expected results for test samples for all machines and analysers. The system also provides standard and ad hoc query reports on various parameters for purposes of resource management, quality assurance and medical audit.